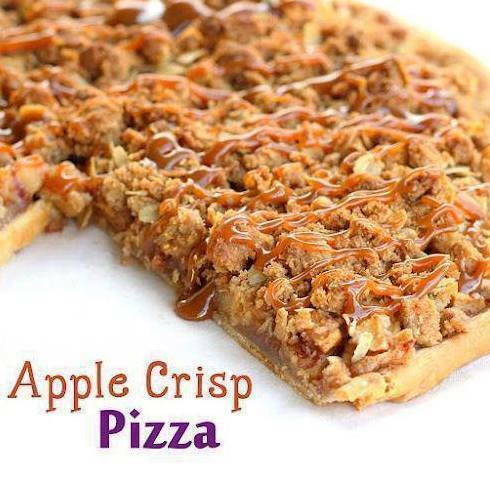 Yummy Apple Crisp Pizza, Please make sure to Like and share this Recipe with your friends on Facebook and also follow us on facebook and Pinterest to get our latest Yummy Recipes. Roll pastry to fit a 12 inch pizza pan; fold under edges to give the pizza a bit of a raised crust. Combine sugar, flour and cinnamon in a medium bowl. Add peeled, diced apples and toss. Arrange the apples in a single layer over the pie crust to completely cover it. For the topping: Combine the flour, brown sugar, oats, cinnamon, and butter in a bowl. Mix well. Sprinkle topping evenly over the apples. lease make sure to Like and share this Recipe with your friends on Facebook and also follow us on facebook and Pinterest to get our latest Yummy Recipes.